The only Native American woman who served as an interpreter and guide for the Lewis and Clark Expedition in 1805 and 1806. As a child, she had been taken by members of the Hidatsa Tribe and lived among them. Later she was sold to a French-Canadian trapper named Toussaint Charbonneau. While the Expedition wintered in the Hidatsa- Mandan Village (1804-1805), they hired Charbonneau as an interpreter for the trip west. *One of them was, of course, Sacagawea, destined to be the most famous member of the Corps of Discovery after the captains themselves. 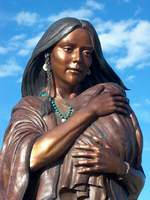 Sacajawea, one of Charbonneau wives, and her baby accompanied the expedition. Jean Baptiste Charbonneau was born February 11,1805, in present day North Dakota with the help of Captain Lewis and some rattlesnake tail. 54 days later Sacagawea wrapped Jean Baptiste onto a cradleboard, strapped him on her back and they began the laborious journey to the coast. Charbonneau stated that her name meant Bird Woman and in the Hidatsa language the name should be properly spelled "Tsakaka-wias". February 11, 1805 - Jean Baptiste Charbonneau was born in present day North Dakota. May 14, 1805 - The boat Sacajawea was riding in was hit by a high wind and nearly capsized. Her calmness earned her compliments from the Captains. "The Indian woman to whom I ascribe equal fortitude and resolution, with any person onboard at the time of the accident, caught and preserved most of the light articles which were washed overboard". July 28, 1805 - Sacajawea was a remarkable woman in time of sorrow. "Our camp is precisely on the spot that the Snake Indians were encamped at the time the Minnetares of the Knife River first came in sight of them five years since. From hence they retreated about three miles up Jefferson's River and concealed themselves in the woods, the Minnetares pursued, attacked them, killed 4 men, 4 women, a number of boys, and made prisoners of all the females and four boys, Sacajawea was one of the female prisoners. I cannot discover that she shows any emotion of sorrow in recollecting this event, or of joy in being restored to her native country; if she has enough to eat and a few trinkets to wear I believe she would be perfectly content anywhere..."
August 8, 1805 - Sacajawea was attached to her country and kin. "The Indian woman recognized the point of a high plain to our right which she informed us was not very distance from the summer retreat of her nation on a river beyond the mountains which runs to the west. This hill she says her nation calls the Beaver's Head, as it resembles the head of that animal. She assures us that we shall either find her people on this river or on the river immediately west..."
August 17, 1805 - Five years later, Sacajawea had an emotional reunion with her brother, Chief Cameahwait; it was Sacajawea who secured the horses that the Expedition needed. "Clark saw Sacajawea, who was with her husband 100 yards ahead, began to dance and show every mark of the most extravagant joy, turning round him and pointing to several Indians, whom he now saw advancing on horseback, sucking her fingers to indicate that they were of her native tribe." Kidnapped as a child, Sacajawea had been torn away from her people, so finding the Shoshone meant more than the purchase of horses -- it meant returning to the land of her birth, for Sacajawea was a Lemhi. "She came into the tent, sat down, and was beginning to interpret, when in the person of Cameahwait she recognized her brother; She instantly jumped up, and ran and embraced him, throwing over him her blanket and weeping profusely." Rozina George tells of her great great great great aunt, Sacajawea, who was captured as a child, and then reunited with her family as a member of the Lewis and Clark Expedition. October 19, 1805 - The presence of Sacajawea was an invitation to the Indians that the white people came in peace. "The sight of this Indian woman, wife to one of our interprs. confirmed those people of our friendly intentions, as no woman ever accompanies a war party of Indians in this quarter..."
November 20, 1805 - Sacajawea, always pleasing the Captains. "One of the Indians had on a roab made of 2 Sea Otters Skins the fur of them were more butifull than any fur I had ever seen both Capt. Lewis & my Self endeavored to purchase the roab with differant articles at length we precurred it for a belt of blue beeds which the - wife of our interpreter Shabono wore around her waste..."
November 24, 1805 - Reaching the place where the Columbia River empties into the Pacific Ocean, the members of the Expedition were given the right to vote on the location where they would settle for the winter. 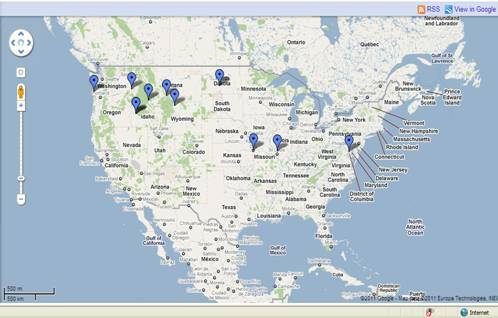 Sacajawea (Janey) in favor of a place where there is plenty of Potas. January 7, 1806 - A whale had washed ashore, near present day Seaside/Cannon Beach, Oregon. Sacajawea accompanied the group to the ocean. "She observed that she had traveled a long way with us to see the great waters, and that now that monstrous fish was also to be seen." July 15, 1806 - Sacajawea proved a valuable guide on the return journey. She remembered trails from her childhood; the most important trail was a large road that passed through a gap in the mountain, which led to Yellowstone River. Today, it is known as Bozeman Pass, Montana. August 17, 1806 - End of the Journey for Sacajawea... returning to the Hidatsa-Mandan Village. "I offered to take the little son a butifull promising child who is 19 months old to which they both himself & wife were willing provided the child had been weened. They observed that in one year the boy would be sufficiently old to leave his mother & he would then take him to me if I would be so friendly as to raise the child ... to which I agreed". Sacajawea on Indian pony, with child in papoose cradle, Henry Altman, 1905. Painting, Sacajawea in boat meeting Chinook party, Amon Carter Museum of Western Art, Fort Worth, Texas, Charles M. Russell. Mural, Lewis and Clark at the Three Forks, Edward Samuel Paxson, Capitol, Helena, Montana. Mural, Capitol, Helena, Montana, Charles M. Russell, 1912. Grave of "Sacajawea of the Shoshonis," on the Shoshoni Reservation, near Lander, Wyoming, 1909. Monument near Mobridge, South Dakota, 1929. Sacajawea maker, near Tendoy, Idaho, west of Lemhi Pass. Bronze tablet on wall of Bishop Randall Chapel, Shoshoni Cemetery, Wyoming, 1931. Granite marker, Shoshoni Cemetery, for Bazil, Baptiste, and Baptiste's daughter Barbara Meyers, 1932. Boulder with bronze tablet, honoring meeting place of Sacajawea and her brother, Camaeahwait, near the confluence of Horse Prairie and Red Rocks creeks, Armstead, Montana, 1914. Boulder and brass tablet erected by Daughters of American Revolution, near Three Forks, Montana, 1914. Sacajawea Creek, Montana, named by Lewis and Clark. It flows into the Missouri River near the confluence of the Musselshell (now known as Crooked Creek). The Sakakawea Trail is 115 miles, starting in Washburn and finishing in Grassy Butte. Most of the drive is on Rte. 200A and Rte. 200. Road trip starts just south of the 178-mile-long Lake Sakakawea. Start this historic drive by taking a short side trip and drive west from Washburn on Rte. 17 to Fort Mandan, where the explorers Lewis and Clark wintered. It was during the winter of 1804-1805, while staying at Fort Mandan, that the explorers added Toussaint Charbonneau and his wife to their team as translators. Charbonneau's wife, a young Shoshone named Sakakawea, provided priceless assistance as a translator to Lewis and Clark for several years. As you tour this part of the country, you can find many places named after the Shoshone translator, including Lake Sakakawea. 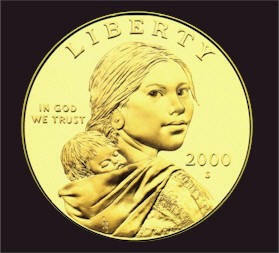 The Golden Dollar's obverse (front) side, designed by American sculptor Glenna Goodacre, depicts the young Shoshone woman, Randy'L He-Dow Teton modeled for the coin) Sacagawea, who accompanied Lewis and Clark on their journey from the Great Northern Plains across the Continental Divide to the Pacific. Historians note that Sacagawea's exceptional diplomatic and navigational skills contributed greatly to the success of the mission. She carried her infant son, Jean Baptiste, on her back throughout the course of the expedition. 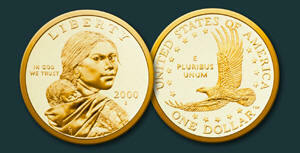 Her significant role as an American woman pioneer won her the distinction of gracing the nation's new coinage. The Golden Dollar's reverse (back) design, by Thomas D. Rogers Sr., presents a soaring American bald eagle encircled by 17 stars - symbolizing the states of the Union at the time of the Lewis and Clark expedition of 1804. President Clinton presented the title of Honorary Sergeant, Regular Army to Sacagawea, a young Shoshone woman who served as Lewis and Clark's guide. Sacagawea was the only woman to accompany the explorers to the Pacific Ocean and back, and her interpretation and navigation skills proved invaluable to the expedition.